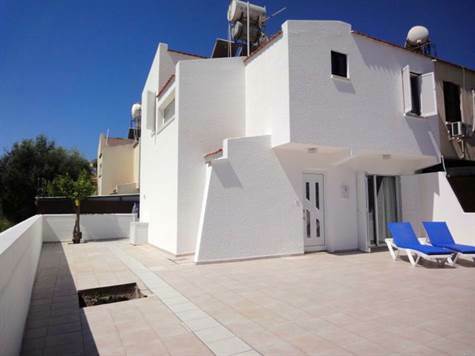 Kato Paphos, Paphos - This spacious 3 bedroom semi-detached villa is ideally situated within easy walking distance to the beach, shops and restaurants of the popular holiday resort of Kato Paphos. The ground floor features a large open plan living room with stone feature fireplace, fully fitted kitchen with breakfast bar, guest cloakroom and large storage cupboard. The kitchen is well equipped with built-in oven, gas hob, extractor fan, washing machine and integrated fridge/freezer. Upstairs there are three good size double bedrooms all with fitted wardrobes and a family size bathroom with built-in vanity unit. Outside there is a huge veranda with wonderful rural views providing lots of space for relaxing, outdoor dining and generally enjoying the idyllic outdoor life. The property is in very good condition and has real character. It is ideal as a holiday home, rental investment or permanent residence. Furniture is included if required and there are full title deeds.